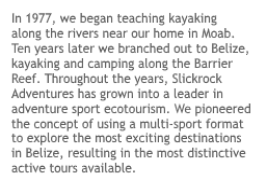 Several of Slickrock’s staff attended the annual Outdoor Retailer Show held in Salt Lake City, UT early this month, where all the latest toys in the outdoor sports industry are first displayed. We attend the show every year to keep abreast of industry trends and to purchase new equipment. 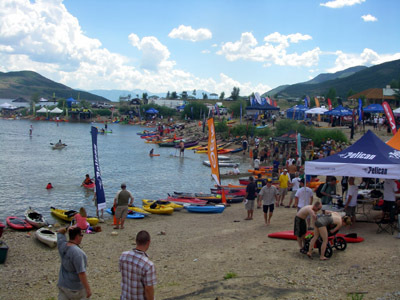 At his year’s demo day at Jordonelle Reservoir, where all the water sport vendors have their latest gear available to try out on the water, paddleboards were all the rage. 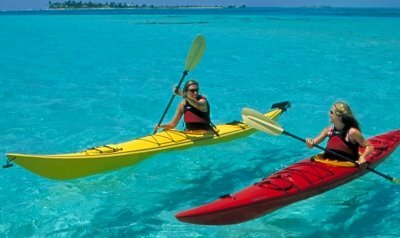 We found some exciting new styles of boards which we plan to add to our fleet of watercraft on the island for the upcoming season. 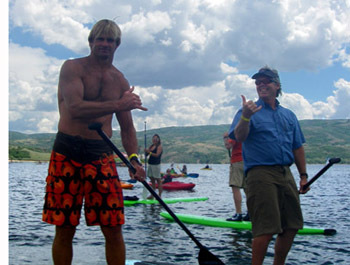 However, one of the biggest thrills of the show was getting to meet the legendary Laird Hamilton, who in credited with ‘inventing’ tow-in surfing and who has been a leading figure in big wave surfing for years. In addition to also ‘inventing’ paddleboarding in its current form, Laird is probably the best known surfer on the planet due to the extensive media coverage he has received for his exploits taking on the biggest, meanest surf on earth. 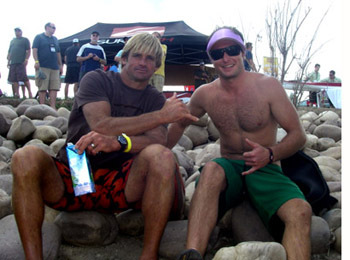 Laird has been featured in all the major surfing movies and other surfing productions.